You either love it or dread it. Garrison Keillor jokes that summer is the only time that Minnesotans lock their doors. Not out of fear of theft but out of fear that someone will secretly leave them a big bag of extra zucchini! 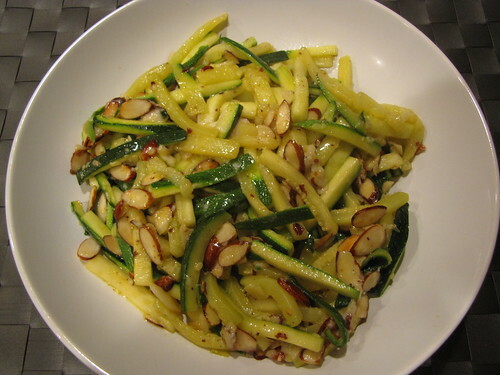 I think that this simple Zucchini & Almond Sauté would make anyone more than happy to eat their veggies. It’s simple and tasty enough for a side dish but hearty enough that I can happily eat a big bowl all by itself. Small cat helper optional but highly recommended. I’m so used to her sitting on the chairs at the kitchen counter that I don’t even notice until I post pictures here. Hi Lulu! 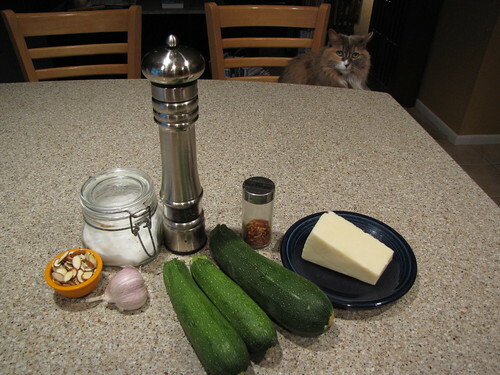 Cut 3 medium zucchini into matchstick sized pieces. 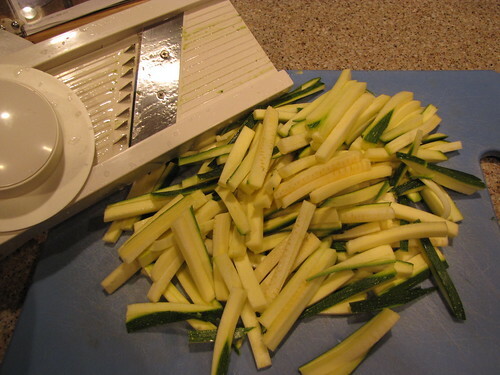 If you have a mandoline slicer, I recommend using the larger or the two settings. You can also cut these by hand by cutting each zucchini lengthwise into long strips and then into smaller, narrow matchsticks. I like the pieces on the thicker side so they stay crisp in the center while they cook. Too small and you will have mush. 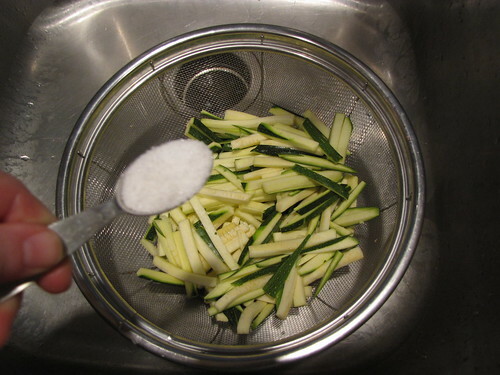 Place the zucchini pieces in a colander or large strainer and toss with ½ teaspoon salt. Let the zucchini stand for 10 minutes to allow the excess moisture to drain away. 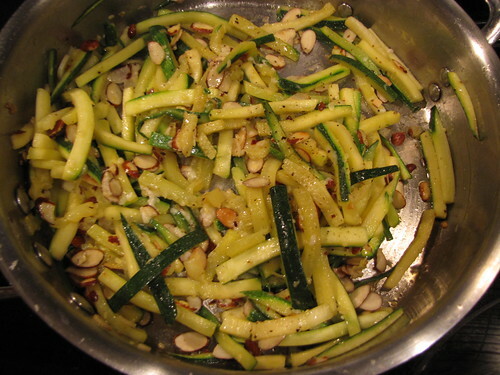 Toast 1/2 cup of sliced almonds over medium heat in a dry pan large enough to accommodate the zucchini. Keep an eye on the nuts so they don’t burn. 3-4 minutes on medium is all it takes. 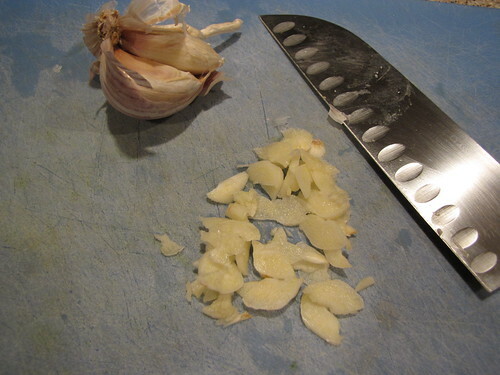 Thinly slice 2 cloves of garlic. We usually chop garlic for recipes, but slicing helps keep the garlic flavor a bit milder allowing the bigger pieces to caramelize while they cook. 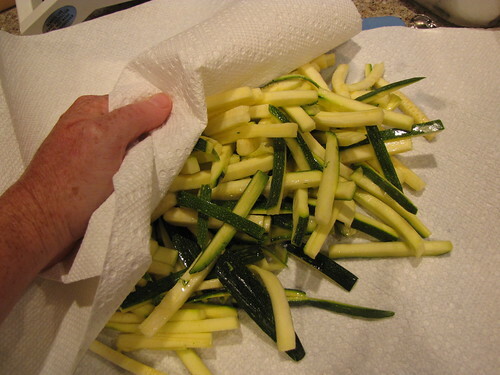 Remove the salted zucchini from the colander and pat dry with paper towels. Do not rinse the zucchini. This step will help keep the zucchini crisp while it cooks. 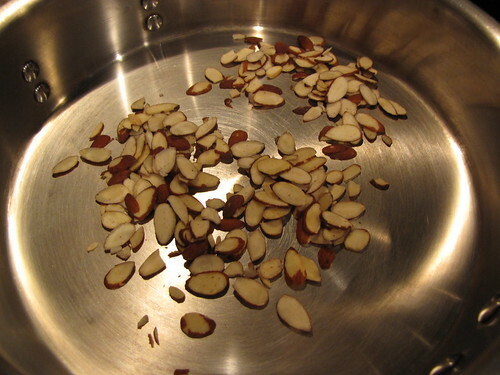 Once the almonds have toasted, remove them from the pan and set aside. 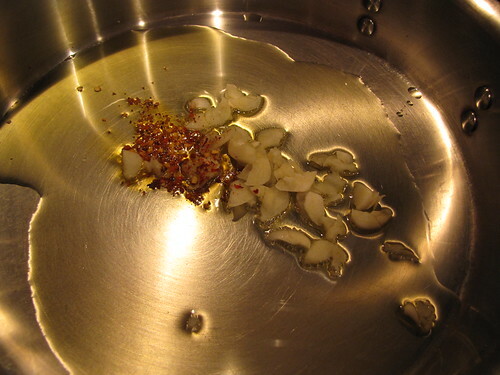 Using the same pan, heat 2 Tablespoons of olive oil, the sliced garlic, and 1/4 teaspoon of crushed red pepper flakes over medium heat. Cook the garlic for about 2 minutes until it starts to sizzle but does not brown. Add the zucchini and sauté over medium high heat until tender but still crisp, about 5 minutes. 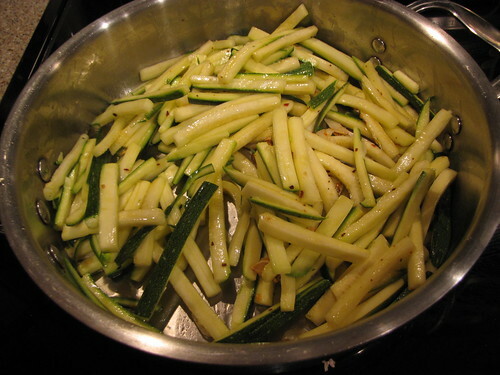 Stir or toss the zucchini frequently so that it gets slightly golden on the edges. 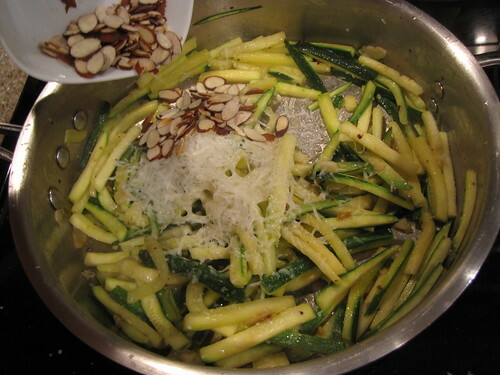 Add the toasted almonds and 1/4 cup of finely grated Romano (or parmesan) cheese. Stir to melt the cheese into the squash and season to taste with salt & pepper. 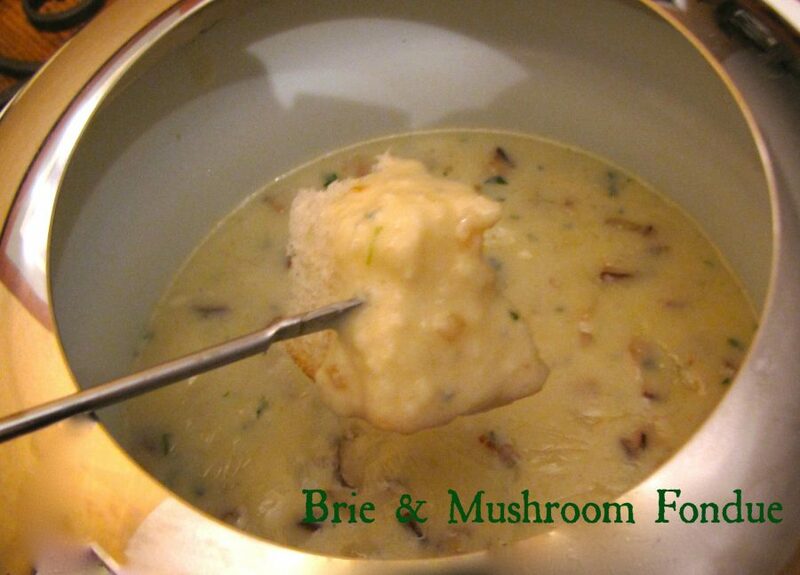 This was a big hit at our house. I made it as a side dish at my parent’s house a few weeks ago and as soon as the garlic hit the pan, everyone came in from the patio to see what was cooking! When zucchini season hits, now you have a plan to carry you through. Plus you can always send your extras to me! ACK! The links are not working and I have no idea why. So, if you’d like a printable copy of the recipe or the shopping list, leave a comment or send me an email and I’ll email one to you ASAP. Sorry, the technology gremlins seem to have gotten the better of me on this one. Would you eat this in a chair? yes, I would eat this any where. Wow. 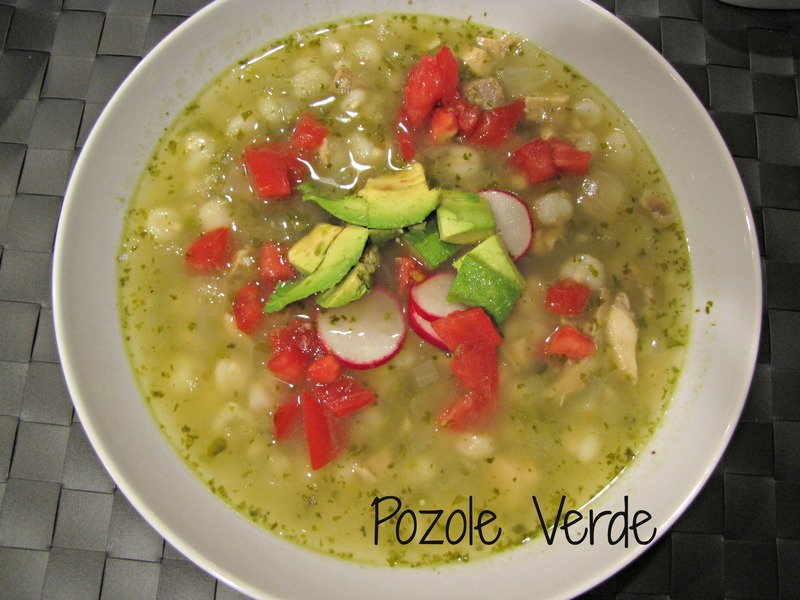 This is another one I’m going to try this week! 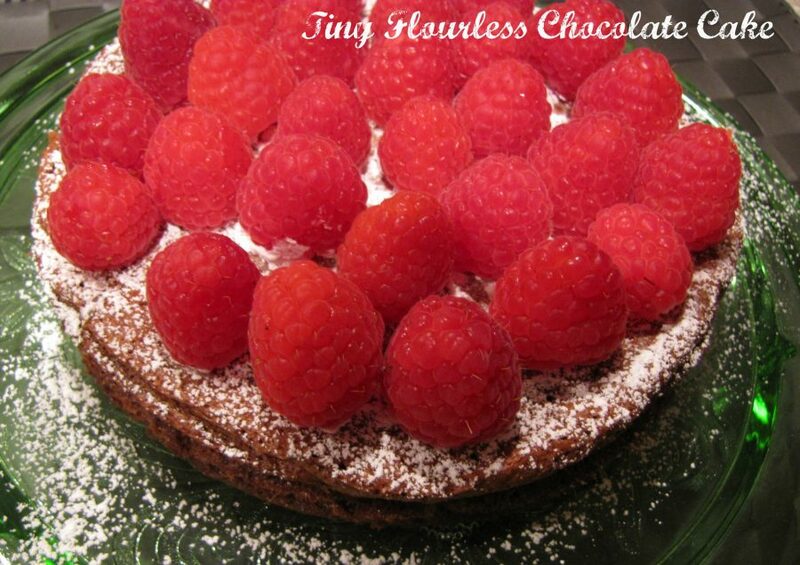 Delish and healthy: LOVE! I really love this. It’s simple but really tasty. 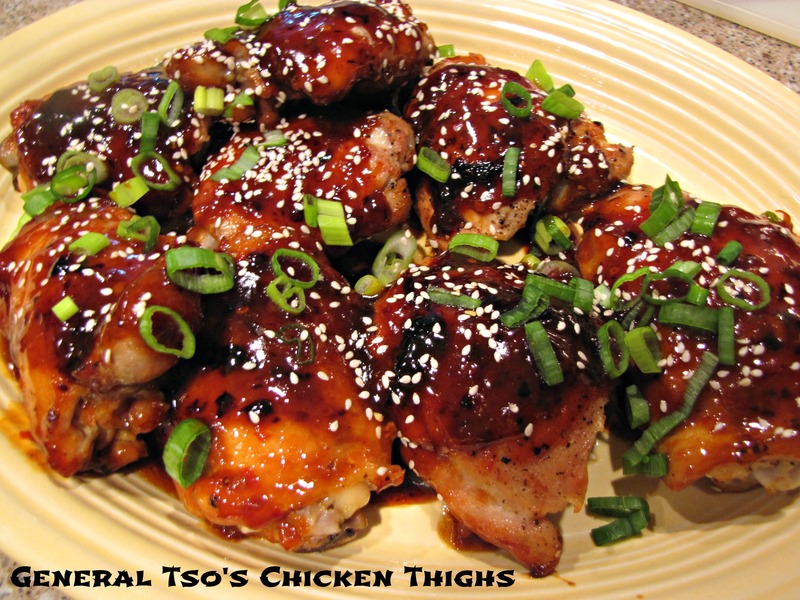 The dumb links for the recipe are still broken so if you want me to email you a copy, let me know.